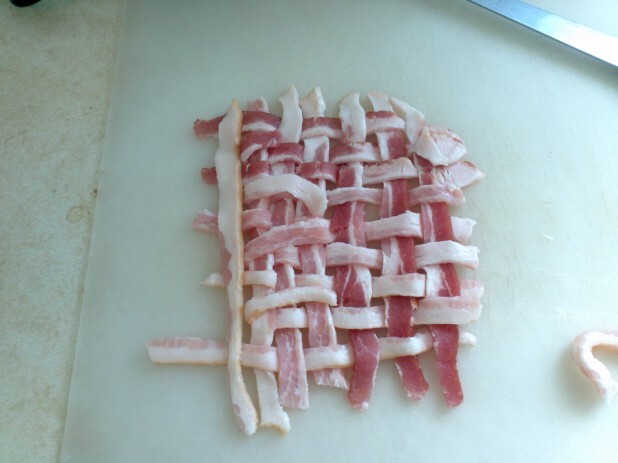 I’ve always been fascinated by bacon weaves. 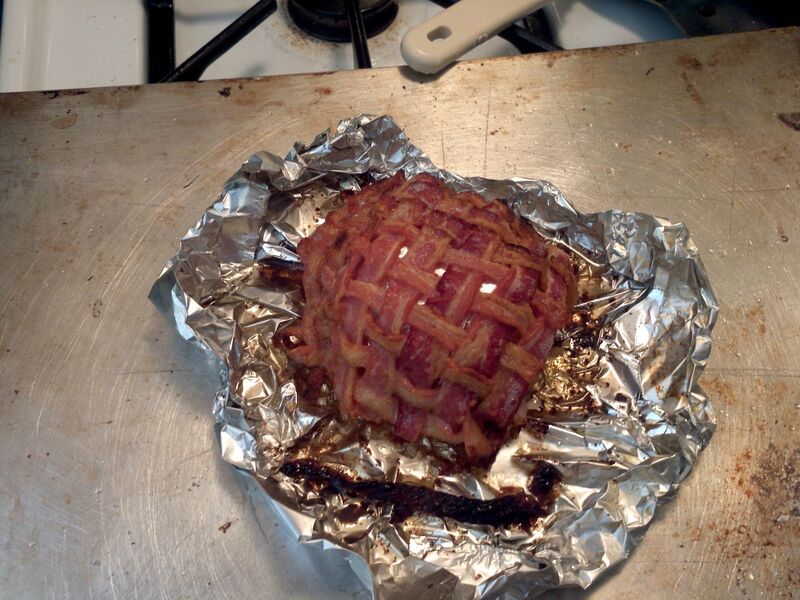 Maybe I was too into basket weaving at summer camp but it really calls to me. My first experience was with creating a bacon explosions. 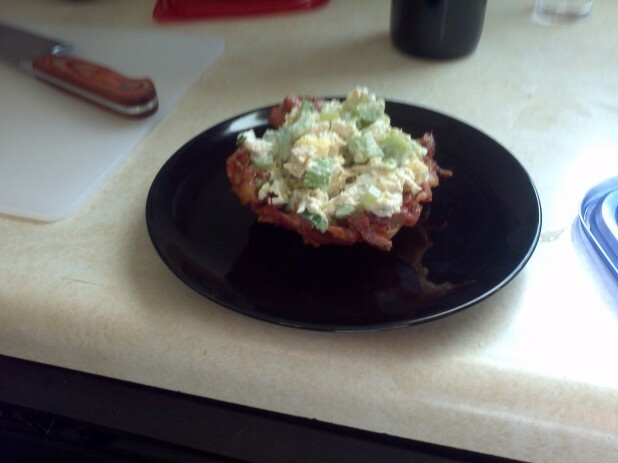 However for that task I used full strips of bacon. Recently I wanted to make a more cup size bacon weave and off I went. 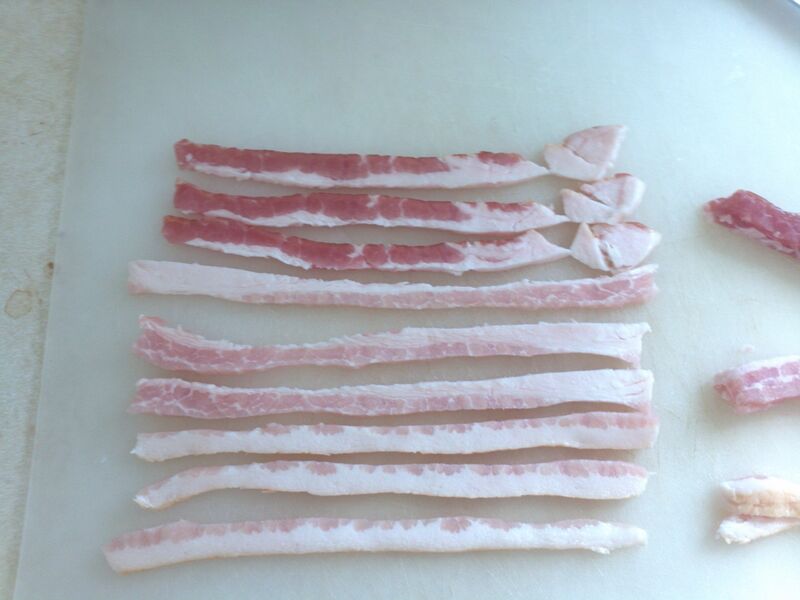 Put three pieces of bacon on your cutting board; make sure they are sturdy pieces and not broken. Cut them into three with a sharp knife. I used a deboning knife which is designed to be very sharp but able to maneuver. Cut the bacon in half, then lay half of the bacon out in rows. Start weaving! Fold over every other piece as shown below and add a new piece on top. Take a mini prep bowl and invert it onto a backing sheet. It might be better to use one with lips unlike I did in case the bacon juice spills. Make sure the bowl is oven safe. 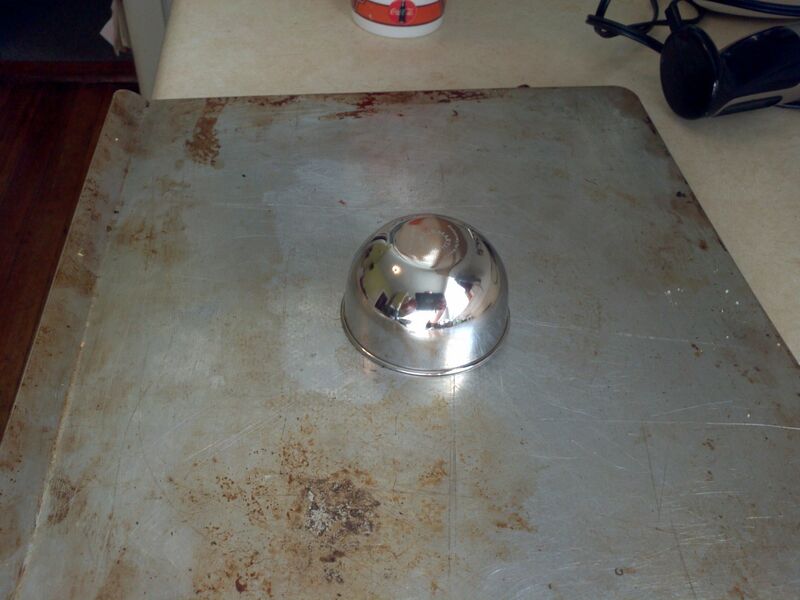 Firmly tent the bowl with tin foil. 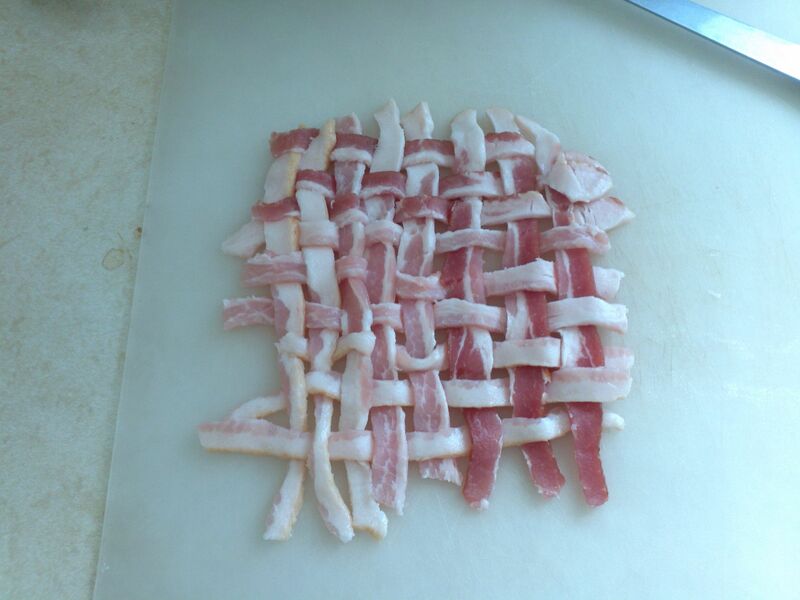 Turn up the edges to catch the bacon grease. 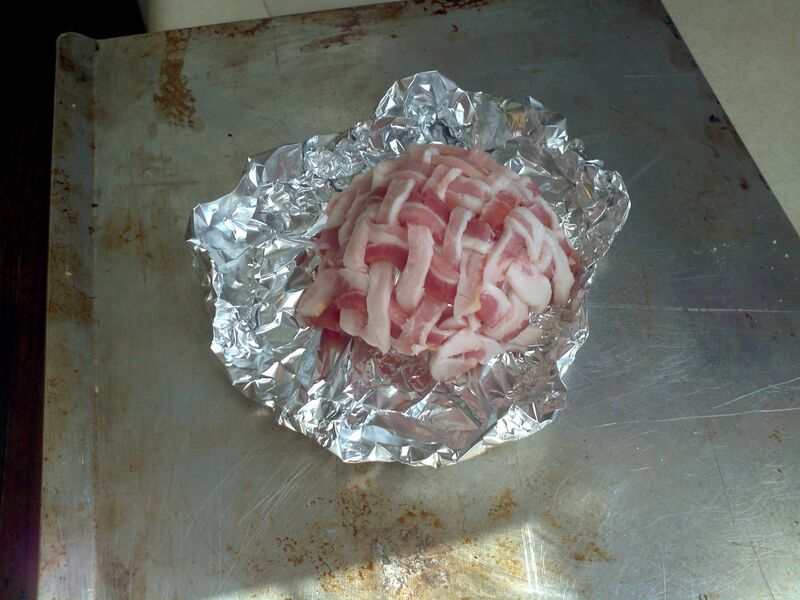 Carefully transfer the weave to the foil. I used a fish spatula. This is a very useful tool for working on this sort of thing since they are really long and thin. Also, if you’re cooking with cast iron it doesn’t matter that its metal. Cook it for 17 minutes at 450 degrees, it should look something like this. And its done!!! Fill it with whatever you fancy. Overall it turned out well but I think next time I would make it larger. It didn’t go far enough down the bowl to make a really obvious bowl. It was still totally delicious! 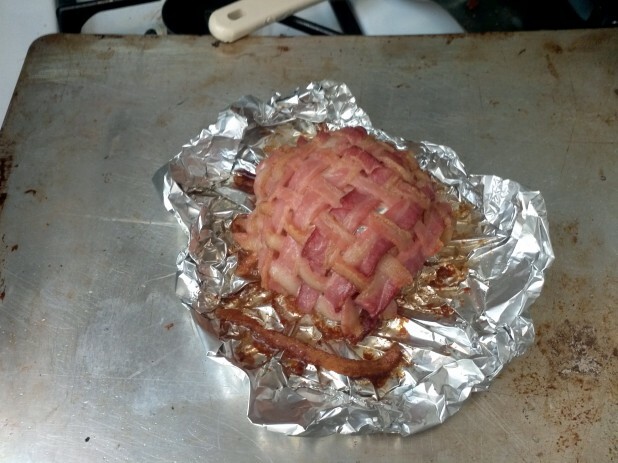 I might also cut the bacon in half and make a full length weave. 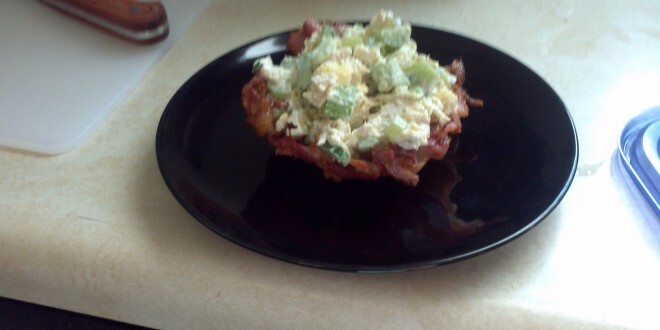 Here is the final product with some Chicken Salad on it. 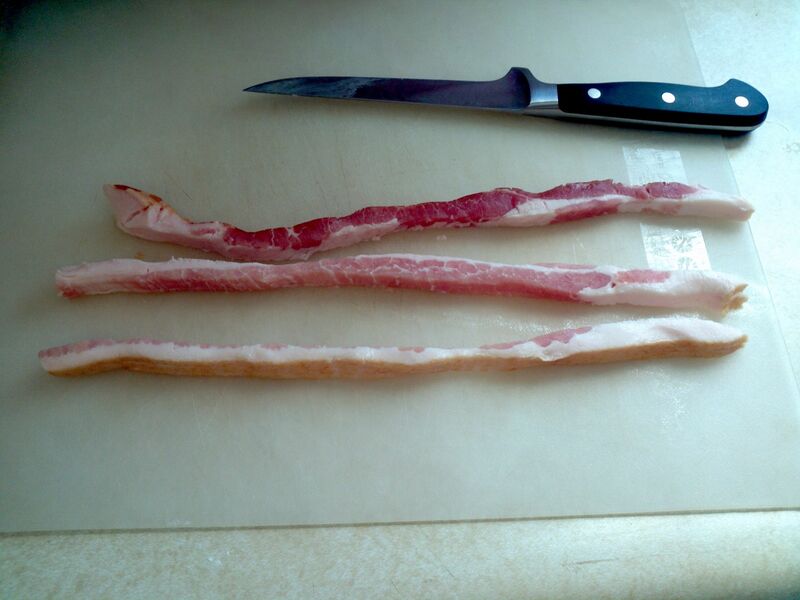 Slice the bacon in three pieces lengthwise with a sharp knife. Cut all the pieces in half. Fold every other piece back and put a new piece down. Repeat until all pieces are used. 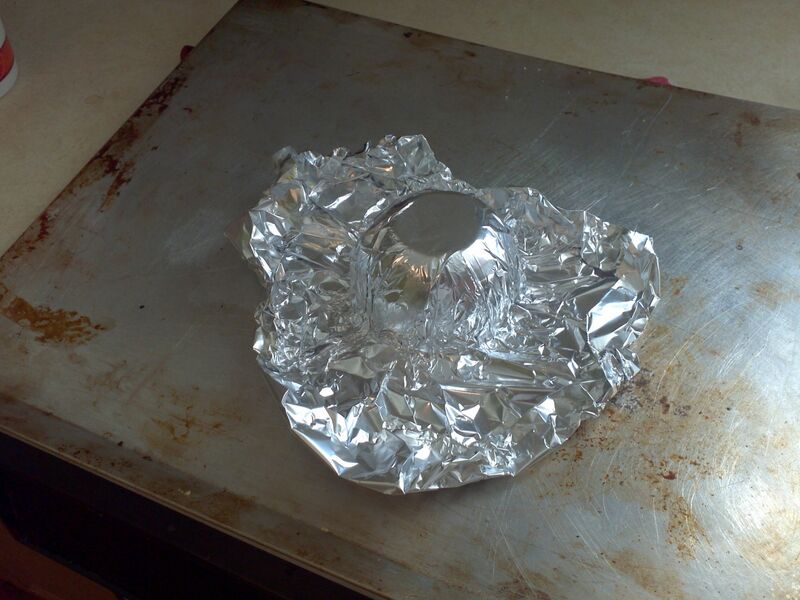 Take a cup, cover it in foil, and place the weave on top of it. Cook for 17 minutes at 450 degrees. Love it! I made one of these myself a couple of months ago and served chilli in it – freaking amazing. Looks like you used a pretty similar technique as well. 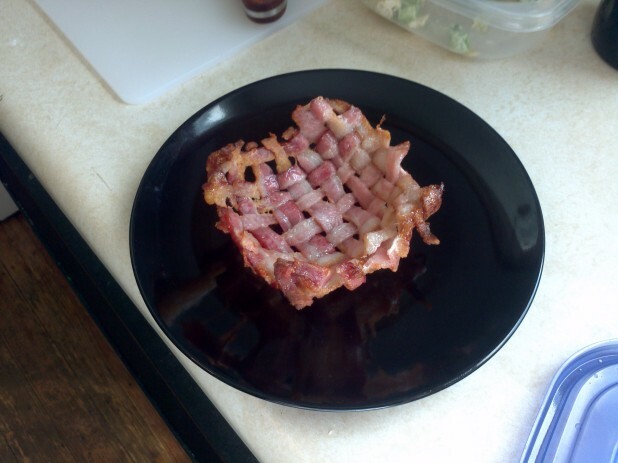 🙂 I’ve also made a bacon cone – you should definitely try that out! Awesome for breakfast on the go, just fill it with scrambled eggs and fried ‘shrooms and you’re sorted. Oh and by the way, try filling either one of your bowls or a cone with some ice cream and drizzle with maple syrup – you won’t regret it. Funny you mention the bacone, I went to Home Depot last weekend and picked up some sheet metal, I was planning to give it a go this weekend if I get time!